Business manager in a box? What if your business had a single, sleek, magical device that could instantly take payments, track sales, manage your team, and view your inventory? Not even kidding. The Clover™ solution is the ace up your sleeve. On your counter or in your hand, actually. 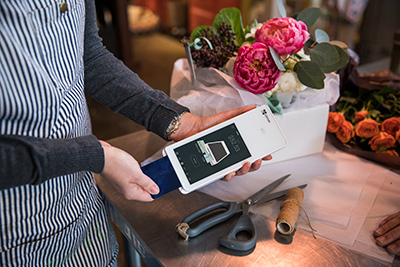 A beautiful, minimal touchscreen tablet, receipt printer and cash drawer (also beautiful), the Clover point-of-service solution is the perfect mix of hardware and software for your business. It's Great Southern's all-in-one management system for business customers. What can the Clover solution do? The Clover App Market also features a robust suite of advanced software and specialized apps so you can build an entire back office system for your business that fits on your front counter. Since the equipment looks really clean and elegant, that works out well. Our most powerful, productive POS device. Built for speed, and with a built-in printer. Clover's processing power paired with your own device. Need something else? From compact card processors like the FD130, to complete systems for e-commerce, we've got a solution in your size. Small yet powerful – take all kinds of payments and print receipts, all from the palm of your hand. A payment system is only as good as the company behind it. Great Southern is proud to partner with BASYS Processing to bring you innovative solutions backed by outstanding customer service. The Clover trademark and logo are owned by Clover Network, Inc., a First Data company. All other trademarks, service marks and trade names referenced in this material are the property of their respective owners. BASYS Processing is a contracted reseller of the Clover™ Solution. This web page or website is not an official page of Clover Network Inc., First Data Corporation, its subsidiaries or affiliated businesses. The Clover™ Solution is being offered in conjunction with an approved BASYS Processing merchant account. Restrictions may apply. Call for details: (800) 386-0711. 24/7 assistance for existing users. Give us a little contact information and a Merchant Services representative will contact you. Leave me blank for Merchant Service.